If you are looking for a subtly luxurious touch to your windows, then you may want to consider blinds made of a wooden material. Not only does wood present a value within itself, but it also offers various stains and styles to nicely fit into your home decor. However, deciding on wooden shades is only half the battle. What about style and functionality? In this blog we will be observing two different options of wood-made blinds for your home. First we will look at Shutter Blinds. These blinds take a more modern spin on your traditional slate-styled blinds. In terms of appearance, these blinds are composed of multiple horizontal slates, that are connected by a singular wooden slate that runs vertically down the middle of the blinds. This vertical slate is used to adjust the blinds from closed, to slightly open, to wide-open. Not only does this give the blinds a dynamic functionality, but it improves durability. No more tangled cords, or uneven blinds resting on your window sill. Kids will have a particularly difficult time messing up Shutter blinds due to its singular function. With Shutter Blinds, the slates always remain in place. One can adjust the amount of light let in, but the blinds as a whole do not raise up or down. In addition to durability is improved functionality. By having the vertical slate, that immediately adjusts the horizontal ones, a person is able to precisely open and close the blinds. 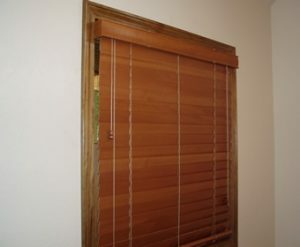 For people who want that “exact” adjustment, Shutter Blinds may be the optimal choice. However, if one wants a full uninterrupted view out of their window, Shutter Blinds fall short, since they cannot be raised up or down. As for overall appearance, Shutter Blinds tend to add value to homes, given their luxurious modern look. They fit perfectly into wide open living spaces and bode well with modern interior designs. • Cannot be raised up/down as a whole. • Vertical slate that runs down the middle may be unsightly based on preference. Next we have traditional Wooden Blinds, sometimes referred to as Venetian Blinds. These blinds are composed of multiple horizontal slates, connected by cord on both sides of the blinds. Venetian style blinds have three free-hanging cords. Each used for a different adjustment. This is the set-up most people are accustomed to with normal blinds, so I will leave it at that. In terms of appearance, these blinds are often though of as the more traditional style. They are very homey while remaining subtly-luxurious. Venetian style blinds adapt well to their surroundings and can fit in nicely with rustic, classic, luxury. While these blinds tend to be more on the traditional side, opting for a darker stain can easily make these blinds fit into more modern-styled homes as well. In other words, instead of your blinds complimenting your home, your home will compliment these blinds. Speaking toward functionality, these blinds offer nothing new to the mix. The most typical blinds have the same functionality as Venetian. This is not necessarily a bad thing, but don’t expect any WOW’s on how the blinds function. The biggest difference in regular blinds and Venetian style is the large wooden slates that make up the blinds. These can be perfect for insulating cold/heat, or shutting out light. Needless to say, venetian style blinds are a solid choice if you are worried about them “fitting in” with your interior design. Their versatility and classic look make them an easy match for most homes, while maintaining a rich bold appearance with the wide slates that make up the blinds. • Slates are attached by cords on each side. These can be damages easily if improperly used. • Functions similar to regular blinds, and offers no WOW factor in terms of functionality. Hopefully, this article has helped better discern between shutter blinds and Venetian style wood blinds. Don’t forget you can get any stain, or wood type to accommodate your home. If you have any questions or concerns, contact Made4ushades for more detailed info on the various options for blinds. We offer custom blinds, shades, and shutter installation. We will come to you! We will work with you until you are satisfied! Our prices are competitive! Serving 50 mile radius around Murphy. WordPress Theme created with Themler by Made 4 U Shades.